Ideas for DIY wedding favours using beads and findings etc. Ideas for Wedding Favours There are 5 products. 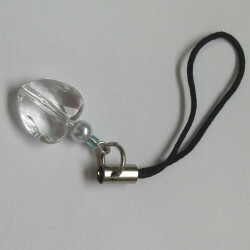 Guardian Angel Bag Clip Kit with Box. Set of 10. 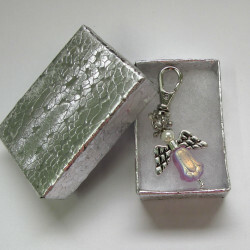 Easy to make and comes with pretty silvery box. Includes instructions, but does not include tools. Round nosed pliers and cutters required. Card box, silver colour with wadding. Pack of 10. 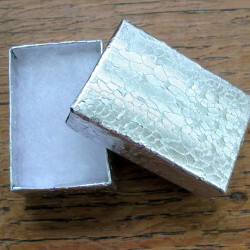 These are cute little boxes measuring approx 47mm long x 32mm wide x 17mm deep. Heart phone strap kit. Makes 50. Heart phone strap kit. Makes 10. Heart phone strap kit. Makes 10. This is a charming item, very simple to make. Comes with simple instruction, tools not included. For larger quantities see FAV004. Kit to make 10 pairs earrings with boxes. Kit to make 10 pairs earrings with boxes. 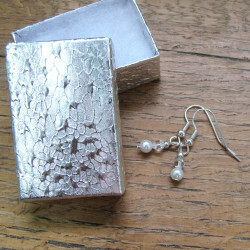 This kit makes pretty little earrings with white glass pearly beads and crystal bicones. The small boxes with wadding are also included. Tools required to make these- round nosed pliers and cutters ( not included). For larger quantites see FAV002.